LifeDance Sinulog 2014, Let's Party Harder! After you attend and say a prayer to our very own Snr. Sto. 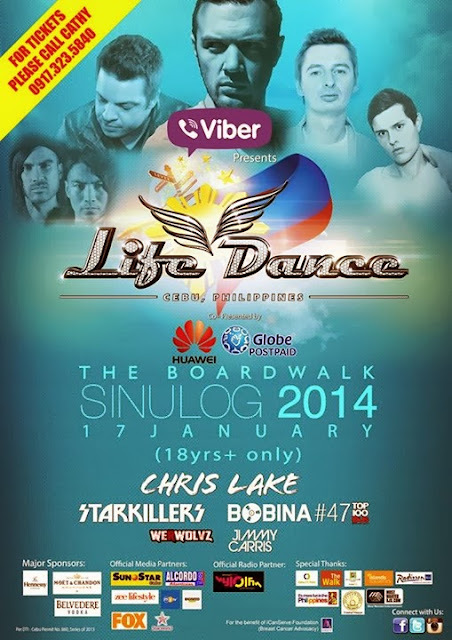 Nino, How about an outdoor party - the best LifeDance Sinulog Party ever?! Revel in the grand Mardi Gras with another legendary LifeDance experience. Presented by VIBER, “Connect freely” and co presented by HUAWEI/Globe Postpaid the most anticipated installment of the LifeDance parties, will be held on Friday, January 17, 2014 at the Cebu Boardwalk, FF Cruz North Reclamation Area, Mandaue City, Cebu. The event will showcase a bevy of international DJs featuring Chris Lake, StarKiller, Bobina, Werwolvz, Jimmy Carris, Lloyd Popp, and Rock Asley and will also feature Cebu’s finest DJs Patrick Rizzari, Steve Chadi, Polky Yu, Cathy Rock, Cris Nelson, Benny Rock, Joachim Giacobee, Gil Quirino and Christian Cuizon. Enthuse your spirits and exceed your wildest expectations with Cebu’s very own DJs kicking off the party grind. Delve to the intoxicating beats and evocative vocal and instrumental trance of then main acts DJ MAG Top 100 DJ's #47 DJ Bobina, a Moscow based DJ who has spent five years as one of the 100 biggest DJs in the world headlining Russia’s electronic dance breakout. Bobina, is heavily supported by none-the-less Armin Van Buuren. Get lost with the eclectic sounds of US talent StarKillers, who gave us the hit like "Pressure" and "Let The Love" to name a few. 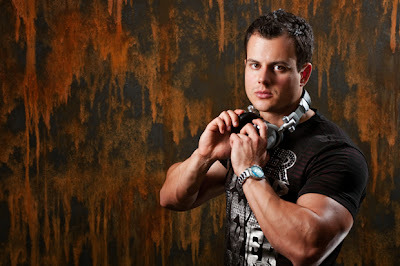 With his fierce energy and cutting edge dance music. Hype the evening and indulge in the deeper throngs of electronic music with main man DJ Chris Lake. The man behind the hits like Helium, Boneless in collaboration with Steve Aoki and Tujamo and Burnin’. The English producer and DJ who is known as the ‘champion of creative freedom’ have captured the attention of audiences around the world and great performances at acclaimed music festivals such as Ultra in Miami now goes around the globe, Alive in Ohio and Sunrise in Somerset, England. All international line-up spins at 10 O’clock in the evening. LifeDance, the Philippines’ biggest world-class outdoor dance party, is proudly endorsed by the Department of Tourism, Its’ more fun in the Philippines. Tickets are priced at P750 for General admission and P1,500 for VIP and sold at Island Souvenirs in Ayala Center Cebu, SM City Cebu, Raintree mall, Island Pasalubong at Arch. Reyes and Marina Mall, Moon Café branches in Ayala Terraces, SM, IT Park, Park Mall, Fudge, Harolds Hotel, Chowabongga in I.T Park and One Mango Place, Dong Juan in One Mango Place and Park Mall, Travel Lab Agency (Boulevard Strip, Capitol Site Cebu City) and Ayala Concierge. Visit www.lifedancecebu.com or follow www.facebook.com/LifeDanceOfficial for real-time updates and a complete listing of accredited ticket outlets and sellers. The event is also brought to you by StarWorld|Fox Channel, MOET Hennesy, MyTV My Channel, Sunstar Cebu, Zee Lifestyle, Y101FM Cebu and BigSeed PR and Events. Special thanks to Ayala Center Cebu and The Walk IT Park. Share your LifeDance experience by using the #Lifedancecebu tag on your online post. Don't know what to wear during the event? Check this out!